If there is one thing that visitors to the Grand Canyon go for, it’s for the stunning views. These views are accessible from a variety of points at the Canyon, including stellar views from the North Rim as well as the South Rim. Outdoor activities are also plentiful at the Canyon, with visitors being offered some of the best hiking, rafting, and camping facilities in the United States. If your next trip is to the Grand Canyon, here is some helpful information regarding the full range of activities offered to visitors at both sides of the Canyon. If you are planning to make camp at Grand Canyon Village, then chances are that you will want to explore the many attractions of the South Rim. 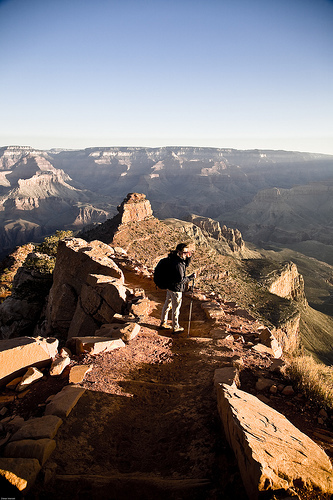 The attractions at the South Rim are abundant, offering visitors everything from art studios and historic dwellings to popular trails, including the Bright Angel Trail. When you arrive at the Grand Canyon Village, you can begin your trip to the Canyon by visiting the Grand Canyon Railway Depot. A stop on the Grand Canyon Railway, this train station is one of the most unique aspects of the South Rim and is the home of Park Services. After visiting the depot, you and your family can pay a visit to Grand Canyon Village’s numerous art studios, including the historic Kolb Studio where some of the Kolb brothers’ best Grand Canyon photography is on display. If the settling of the Grand Canyon area interests you, you may also want to plan a stop at the Buckey O’Neill Cabin, the Bright Angel Lodge or even the Hopi House, a true-to-life representation of a Hopi dwelling. The South Rim is undoubtedly the one place at the Canyon where visitors can participate in a variety of cultural and historical activities, and not just take part in the natural landscape offered by the Grand Canyon. For those visitors who are far more interested in interacting with the Canyon itself, the North Rim may offer exactly what they are looking for. The North Rim is devoid of many of the cultural activities provided by the South Rim, which means that there are often less crowds and families in the area. Those lovers of nature travel in hordes to the North Rim, and often get prime access to the views and trails offered by the North Rim thanks to its thin crowds. A popular trail at the North Rim is the North Kaibab Trail, and well-loved vantage points include Bright Angel Point and Point Sublime. Charity Jackson wrote this article on behalf of Las Vegas Grand Canyon Tours, please click the link to book your trip today.